Mango muffins? Yes, mango! If you limit your muffins to blueberries, lemons, and the occasionally cranberry, you are totally missing out. 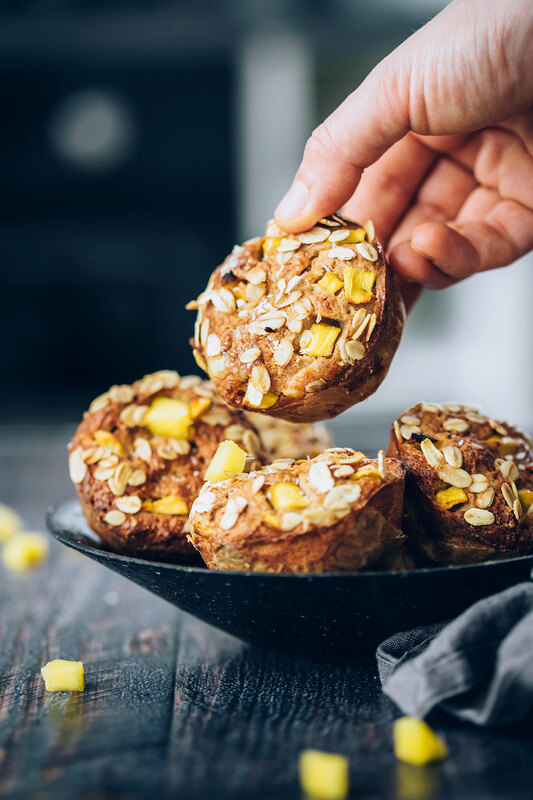 Mangoes happen to be one of my absolute favorite additions to muffins–they add natural sweetness and let’s be honest, mangoes are the best fruit. While mangoes are available pretty much year-round, I’ve found that choosing a good one is kind of a crapshoot most of the year. How frustrating is it to pay a pretty penny for a mango, get it home, and slice it open to see that it’s brown inside?! Gross! March is my favorite time to buy mangoes because ataulfo mangoes (also known as champagne mangoes) are in season and they are perfect. (Well, most of the time. There are no guarantees in life or in mangoes.) They’re the sweetest, they’re not stringy, and when they’re in season, they are cheap! cheap! cheap! So if you can get your hands on them, do it! On the subject of unexpected fruit in muffins, one time when making this recipe, my daughter suggested adding kiwi along with the mangoes. I was skeptical, but some battles are not worth fighting, so I went along with it and it was actually good! The kiwis were a bit tart and played off of the sweetness of the mangoes quite well. If you’re feeling adventurous or happen to cut into your mango to find that it’s brown inside, kiwi can be swapped in for half of the mango. 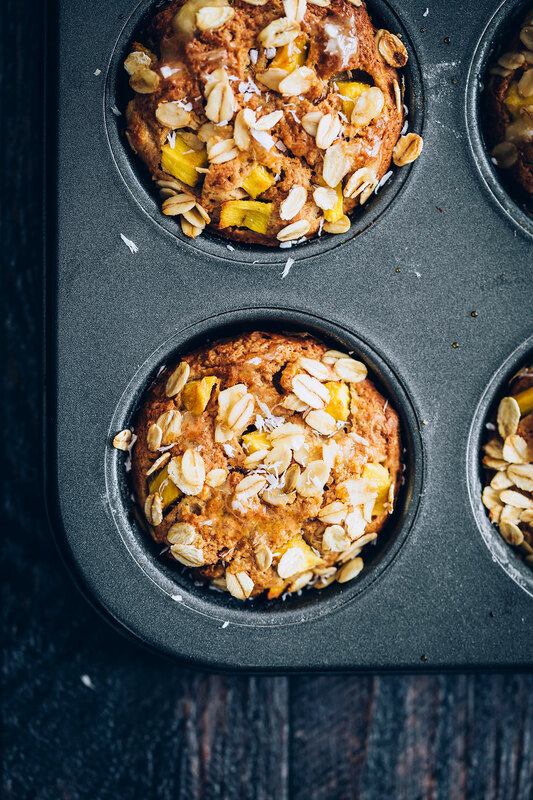 These honey-sweetened mango muffins are the perfect way to start the day. Preheat oven to 400ºF and line a muffin tin with 12 liners. In a large bowl, whisk together flours, brown sugar, baking powder, and baking soda. Stir together the remaining ingredients, except the mango, in another bowl. Pour the wet mixture into the dry mixture and stir until all the flour is incorporated. Gently fold in the diced mango. Divide the batter into the muffin cups. Bake for about 20 minutes or until a toothpick inserted into the center of a muffin comes out clean. Cool the muffins in the tins for 5 minutes, then transfer them to a wire rack to finish cooling.